Meat pies make delicious and hearty comfort foods. 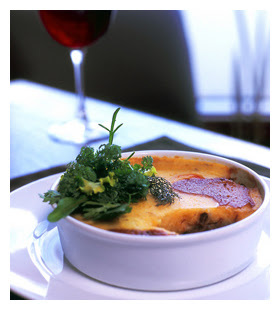 Shepherd’s pies or cottage pies are made with roasted meat and mashed potato cooked in a pie dish. Technically, a shepherd’s pie is made with mutton and a cottage pie is made with beef, but you’ll often find shepherd’s pie used synonymously with cottage pie regardless of choice of meat. Northbrook’s Prairie Grass Cafe serves a delicious Untraditional Shepherd’s Pie, made with all natural beef and a puree of potatoes, parsnips and butternut squash. It’s a perfect fall dish. Chefs Sarah Stegner and George Bumbaris share their recipe for this untraditional pie. Pair it with a salad of mixed greens, Honeycrisp apples, goat cheese and toasted walnuts. Season the beef with salt and pepper. Sear the meat in olive oil in a large hot pan over medium-high heat. Stir occasionally, until the meat is browned on all sides. Remove meat from the pan and sauté onions until tender. Add garlic, carrots, and celery. Return the meat to the pan. Add the chicken stock and demi-glace. If using, tie Ghost pepper with kitchen twine (or place in bouquet garni bag) and lower into liquid-taste often until desired heat is achieved, then carefully remove and discard. Be careful not to touch the pepper with uncovered hands. Cover the pan and cook slowly until the meat is tender. Taste and adjust seasoning. Stir in the Swiss chard and place in an oven-proof casserole dish, or divide evenly between 4 smaller crocks. Mix together the above ingredients. Spread on top of braised meat in casserole dish (or divide into 4 portions and spread over meat in individual crocks). Place in 400-degree oven for 30 minutes, until potatoes begin to brown.